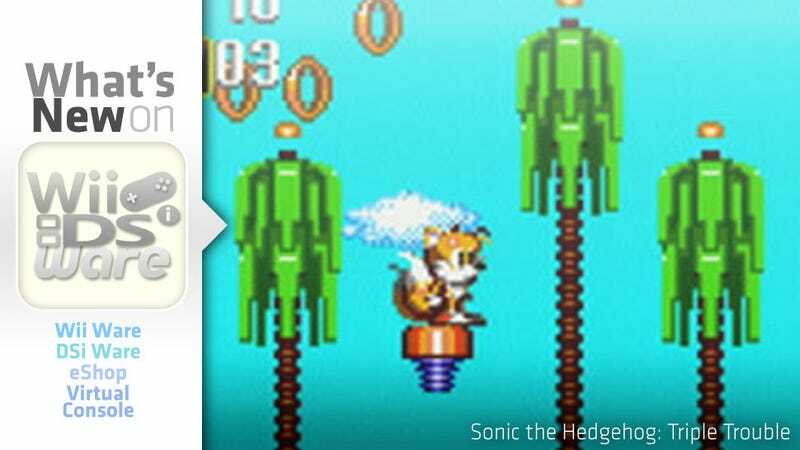 The first handheld gaming device to go head-to-head with the Game Boy (the Atari Lynx barely counts) reaches out its electronic hand in friendship to its one-time enemy, as three Game Gear games become playable on the Nintendo 3DS. How humbling this must be. It's okay Shinobi, Sonic the Hedgehog and Dragon Crystal; it's not your fault the platform you were one tanked. When we imagine alternate realities in which Sega continued on as a hardware manufacturer and Nintendo winds up making Mario games for whatever consoles Microsoft and Toshiba have released at the time (in this alternate reality Toshiba replaces Sony), you are three bright, shining stars, remembered fondly for your significant contributions to gaming culture. In that alternate reality I drive a Lexus that can transform into a helicopter. It's the best alternate reality ever. Oh well, back to the real world. Samurai Shodown IV: Amakusa's Revenge is the fourth installment in the Samurai Shodown series, which launched in 1996. The combat system is essentially the same as in the third installment, Blades of Blood, with tweaks added to enhance the combat experience, such as a vastly altered Rage Explosion System and more powerful chain combos. The ending also changes depending on the time it takes to clear the game, encouraging players to improve their skills and speed if they want to see the One True Ending. Players can choose from 17 samurai warriors, including new characters Kazuki Kazama and Sogetsu Kazama, to battle their way through the game. Enemies have come in search of your Treasure, Captain! Pirates Assault is tower defense game that brings a little twist to the genre. A treasure must be protected, and to accomplish that you have to build the best defense strategy. Even if some pieces of the treasure are stolen, they can be retrieved as long as the enemy that stole your treasure is on the screen and alive. If the enemy is sunk, that piece of treasure can't be recovered. Destroy the enemies with bombs, shurikens, a crescent blade and more. Use the magic of the ninja to wreak havoc with the force of a tornado or the blinding glow of lightning. When all else fails, turn your body into a living bomb and explode with concussive damage. Do not stop until the City of Fear is annihilated! Are you ready for the challenge of Ninja warfare? Classic side-scrolling Sonic action. Play as Sonic and Tails. While the evil genius Dr. Robotnik is testing the ultmate destructive weapon, one of his assistants makes a mistake causing his lab to explode and scattering five Chaos Emeralds across the planet Mobius. Sonic and Tails spin-dash to rescue them. Tricky Knuckles streaks right behind, with sticky-fingered Nack the Weasel joining the hunt. Its a triple-threat race to see who will get the Emeralds first! Classic turn-based dungeon RPG. 30 randomly generated dungeons. Imagine a glowing magic crystal. As you gaze into it, an intense force pulls you in and causes a black out. You pinch yourself. But you don't wake up. You're caught in a fantastic world of unearthly beauty and deadly demons. Here, countless evil forces confront you. Your only ally is your loyal pet dragon. Blaze a trail through the treacherous labyrinths of four magic kingdoms - collecting weapons, armor, magic books, potions, rods and rings as you go. Fend off enormous insects, monstrous centepedes and sneaky sand sharks. Pass through 30 worlds in search of the Magic Goblet. There's no way out of this musical nightmare... until you find it.